Holmes: Well then, set light to the straw, will you? Lestrade: What’s this? Set light to it! Holmes: More smoke than fire, Lestrade. Now, gentlemen, if you will all join me in a shout of “Fire!” when I give the word. In scene 6, Holmes returns to the crime scene, Oldacre’s burnt down house, to test his theory. Part of the house is still standing, so with the help of Watson, Holmes goes about measuring rooms and hallways. The measurements are consistent with his theory so he goes on to his next step. At this point, Lestrade thinks he is crazy, but he is willing to play along for a while. Holmes gets Lestrades’ police officers to help him by bringing straw and water. He lights the damp straw on file which creates a lot of smoke. 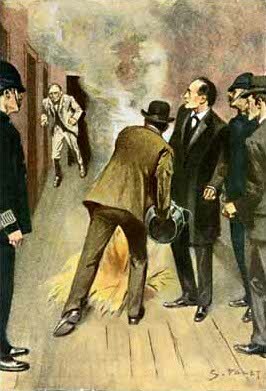 He then instructs Watson, Lestrade, and the police officers to join with him in yelling, “Fire!” This is Holmes final test of his new theory, and the results are very successful. They lead to the arrest of the real criminal.